The Wahiba Sands are undoubtedly one of the major attractions in Oman and rarely do tourists choose to skip the area if they are close by. These days, there are a number of options for camping out in the desert in a tent or desert camp, ranging from basic to ultra luxurious. Think glamping if you are looking for a night of Arabian Night styled camping and entertainment in Oman. 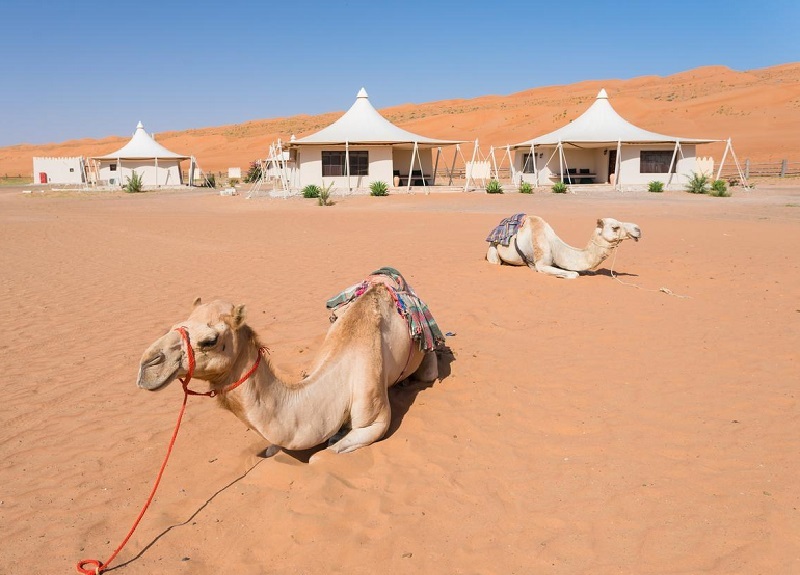 Here are the top desert camps in Oman. These are not just group of wild terrain where anyone can pitch a tent. Each camp has its own unique setup and cultural element. Each desert camp below is chosen keeping in mind the uniqueness it can bring to your night camping holiday in Oman. The Wahiba Sands or the Al Sharqiya Sands ranks among the top attractions of Oman making it a must visit on your trip to Oman and the first place for night camping in Oman for obvious reasons. 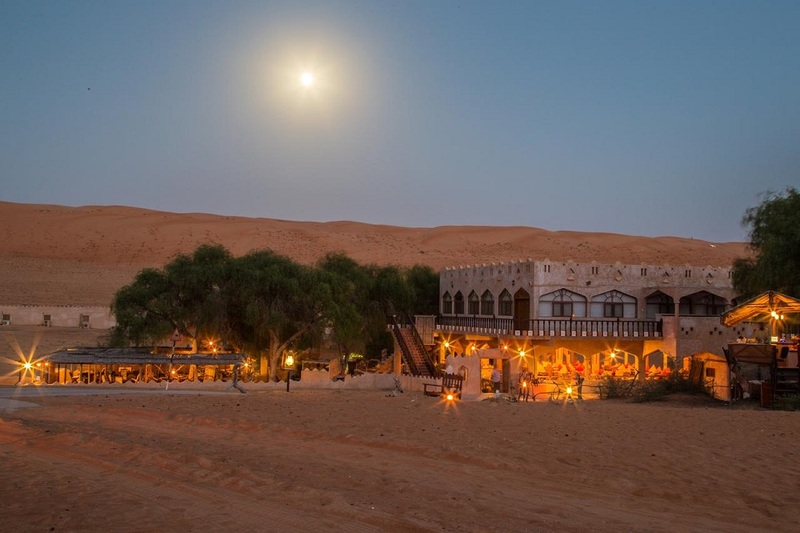 If you are looking to pamper yourself and to splurge, when it comes to Omani desert camps, the Desert Nights Camp, a 5-star hotel in the Wahiba Sands is the ultimate indulgence. If the thought of tented accommodations doesn't sound luxurious, you'll be in for a huge surprise at The Desert Nights Camp. 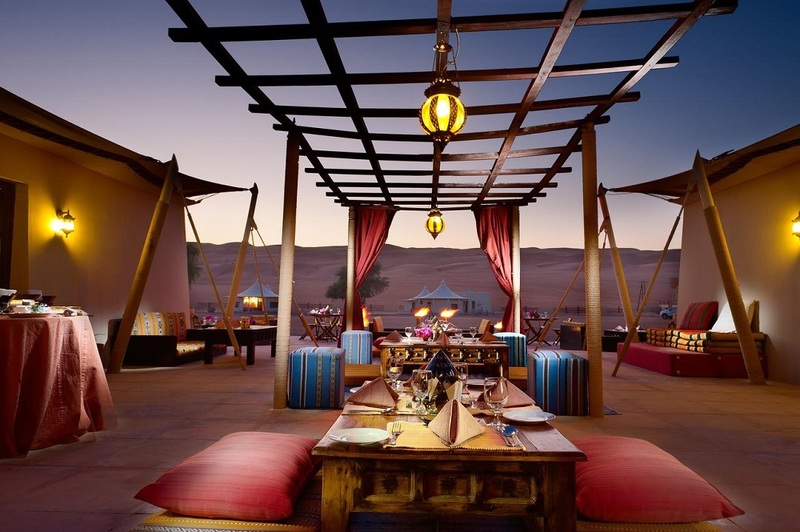 Consisting of 39 luxurious Bedouin-style tents the camp is spread across ten acres of golden sands in the Omani Desert. Each tent has all the modern facilities that one could desire while offering the feel of the exterior relaxing area, covered sitting room, a spacious bedroom, and en suite bathroom. Enjoy the singular experience of going for a camel ride at sunset. 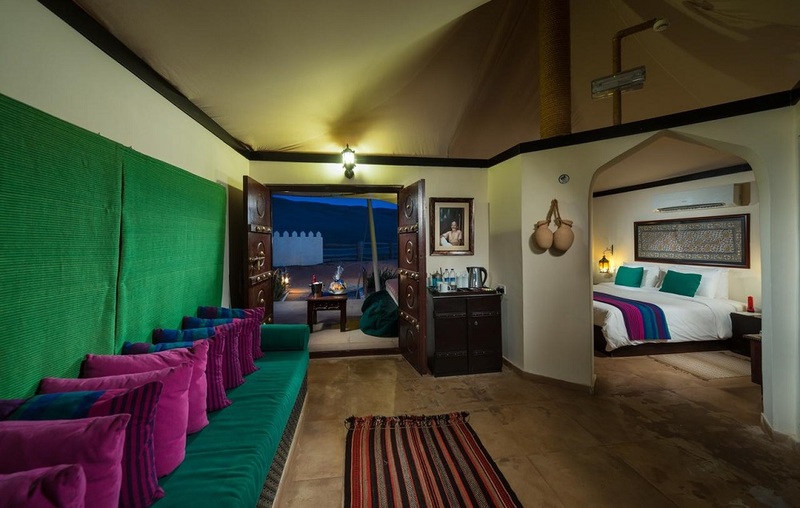 After a long day of dune bashing and going quad bike riding through the golden red sands of the Wahiba, relax in the fully air-conditioned rooms and let yourself be pampered at this luxurious desert hotel in Oman. Feast on traditional Omani delicacies and let yourself drift into the magical nights and in the flickering glow of the campfire as you are ushered into a world of unparalleled luxury and comfort. When you arrive at this luxury camp in the Wahiba desert, wipe away the tiredness of travel with cold towels, and relax in the Omani styled majlis, while enjoying delicious Omani dates and traditional Arabic coffee, ‘Khawa’. After a long day, relax at the Two Dunes Restaurant that lets you experience authentic Arabic cuisine and feast on the culinary delights prepared by the expert chefs there. The Two Dunes offers a superb service along with delicious dishes and an atmosphere of relaxed refinement to make your dining experience at this Oman desert hotel absolutely perfect. Choose to dine in air-conditioned comfort or under starry skies as the gentle desert breeze whets your appetite. At either place, you can taste the rich, magnificent culinary creations of our chefs that are a delight to the taste buds. Explore the recreation area of this Desert Hotel in Oman, which is equipped with a mini library, a host of indoor games and a pool table and you can even watch your favourite movie on the DVD. The camp also offers a Toddler Play Area and a Children’s Indoor Playground offers climbing and riding activities. The camp can arrange for a variety of desert activities according to your interests. Some of the most popular excursions include a Visit the intriguing Wadi Bani Khalid, a visit to the old fort in Mantrib, souq tour, Bedouin family house visit, an Exhilarating Trek on Dunes, and Sand Boarding to mention a few. 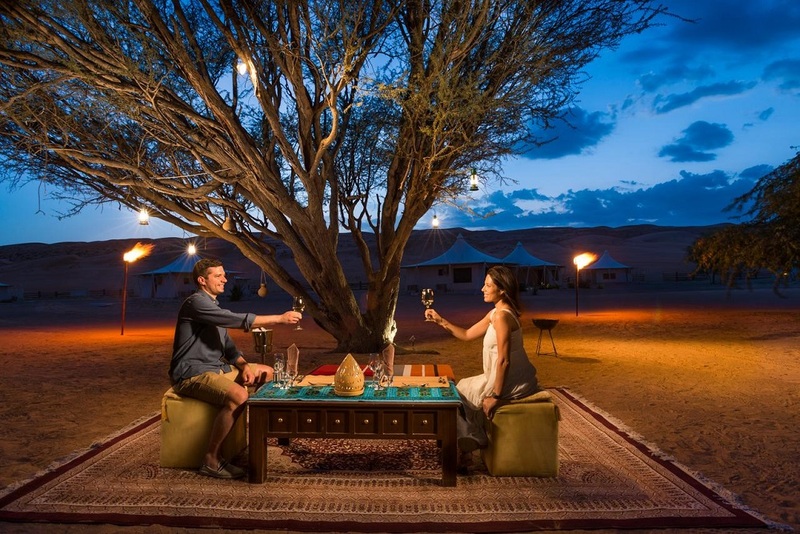 This unique desert camp at Wahiba offer not just a spiritual, and cultural experience of life in the desert but does so in style and comfort making for a luxury stay at the heart of the Wahiba Sands. 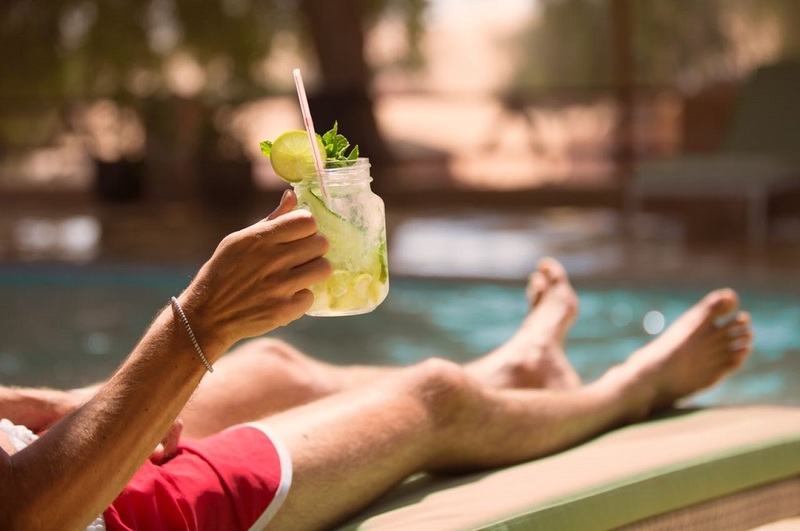 For those lazy times, you just want to enjoy your surrounding you can head over to The Desert Ship Pool side which offers a relaxing yet exciting desert experiences, with amazing view of dunes around. Here you can play games like Billiards and snack as you lounge by the poolside. The Arabian Nights Restaurant is located in heart of the camp and next to the swimming pool with three separate dining areas accommodating well over a hundred people and offering separate areas for restaurant style and Arabic style dinning experience. All three dining areas however serve both international and Arabic buffet. 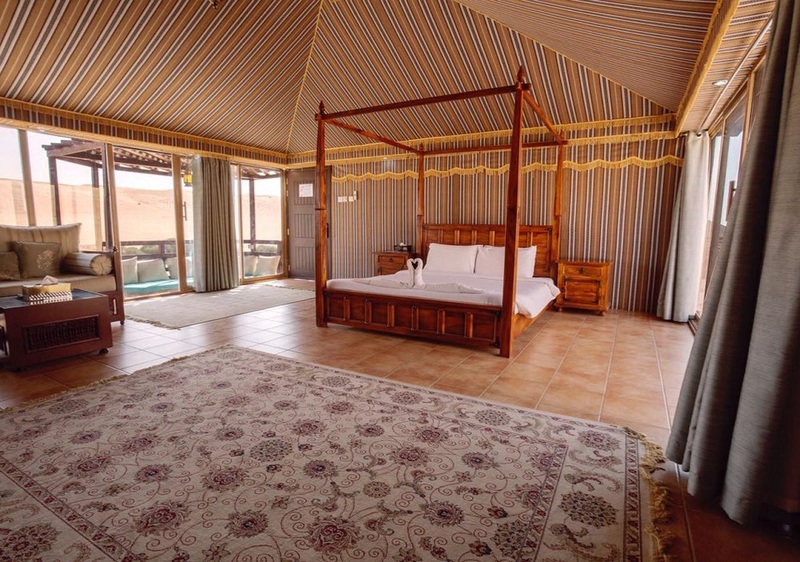 You can choose to stay in an authentic Arabic style Tent whose size of four sqm is a perfect example of real life Bedouins tents, while the Sheikh Tent with its goat and sheep wool fibres is representative of those who managed a luxurious life in the desert. The Ameer tent is fitted with reflective glass in East and West for guests to get perfect view of sunrise and sunset with the Sand House standing in for a luxury wing with reflective glass all around the house, with a private Balcony, an Arabic Style Open setting Area with all the facilities. The camp offers entertainment options like Camel Safari, Horse Safari, Dune Bashing, Coffee with Bedouin Family, Desert Trekking with Bedouin Guide, Camp Fires, Outdoor Meals, Dart Board, Volleyball, Sand Sliding, Books Corner, Table Games, a Children Playing Yard, Arabian Gazelle Yard, Arabian Oryx Yard, Bedouin Dance among others. The 1001 Nights Camp also makes for a great corporate of group getaway with its comparatively large number of rooms, dining options and the Shahryar Hall, a party hall that can be customized to the guest's needs. 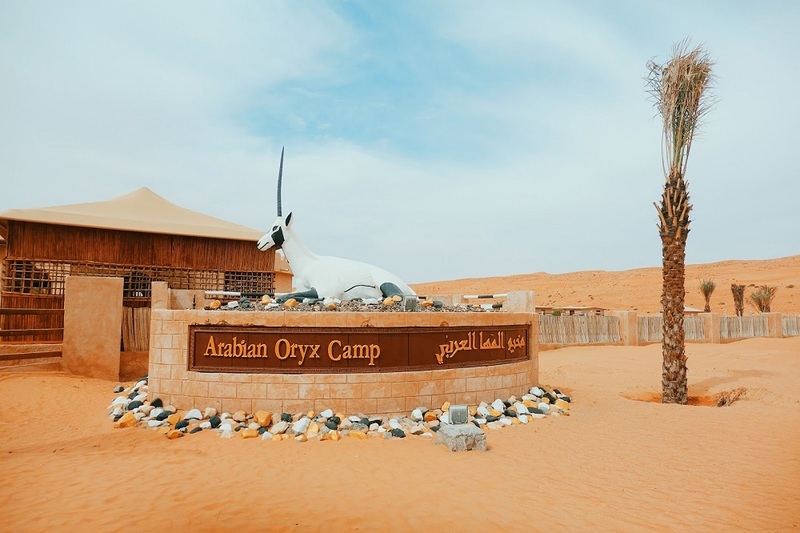 Over fifteen years ago the owners of the Arabian Oryx Camp, set out to provide an authentic Bedouin experience for visitors to Oman. They wished to create a welcoming environment where they could share the beauty of the desert with their guests and they have succeeded in doing so. They currently have on offer over sixty air-conditioned cabins with all the modern facilities one could desire. This is accompanied by food prepared in traditional ways, like being baked in the sand or cooked over a campfire and as the day comes to an end, the guests can enjoy traditional musical entertainment or savour an evening counting the endless stars in the sky. Guests can go on a guided tour with expert guides to take in the breathtaking moment when the sun's light transforms the horizon into a magical portrait or set out on a desert safari whether by 4-wheel drive or on camelback or by foot. The camp can also arrange for exciting activities like Dune Bashing, Sand Surfing, Quad Biking or All Terrain Vehicles (ATVs) Driving, and Guided Trekking & Hiking. 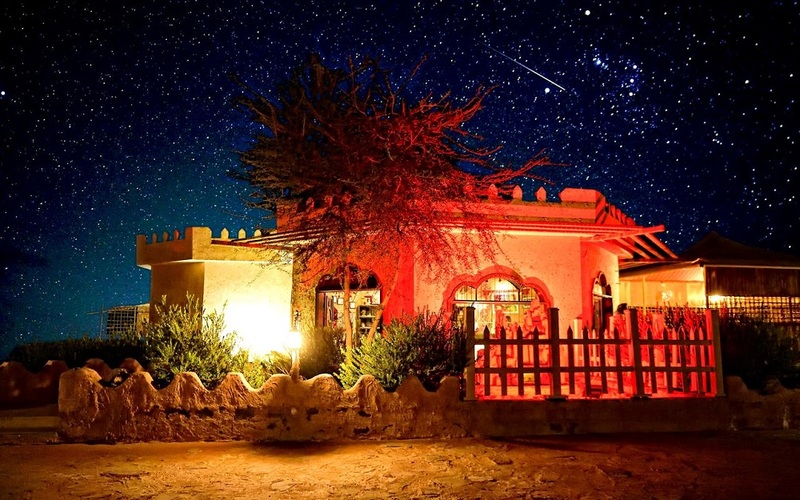 Guests can also choose to visit Bedouin houses to learn about their culture, get Henna Painting and visit Wadi Bani Khalid to take a dip in the waters there. And those looking for an intimate getaway in the desert can book the special Dinner on the Dunes package along with their stay. Guests can choose one of the varied rooms or suites according to their requirements to make their stay as comfortable as possible.